Listen now as Richard Sheridan and his team bring joy to work! I had the great pleasure of speaking with Richard Sheridan, Founder and CEO of Menlo Innovations, and two of his terrific teammates, Laura Elliot and Ryan Heisler. As you listen in on our conversation, you'll hear how you too can change your workplace so that it brings "Joy" to you, your clients and your team who all pull together to get the "job" done. Enjoy! During a difficult mid-career in the chaotic technology industry, the great visionary Richard Sheridan had an all-consuming thought: Things can be better. Much better. He knew he had to find a way. His search led him to literature and history, but especially to the Thomas Edison Center at Menlo Park in Edison, NJ, which served as his guide to create a workplace filled with camaraderie, human energy, creativity and productivity. Then in 2001, Rich and James Goebel co-founded Menlo Innovations to "end human suffering in the world as it relates to technology" by returning joy to one of the most unique endeavors undertaken by mankind: the invention of software. The entire staff works in open space, using two-person teams that shift every few weeks. The tone is one of great collaboration and communication, and creativity is abundant. 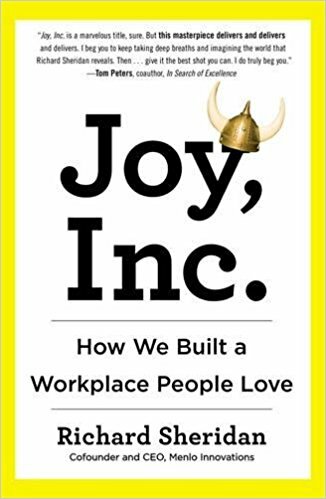 Ryan's bestselling book, "Joy, Inc.: How We Built a Workplace People Love," detailing Menlo's joyful culture has been an international hit, demonstrating how hungry people are for this kind of message. To highlight their unique approach to custom software design—that delights users rather than frustrates them—Rich and James created High-tech Anthropology®, a process so unique that 4,000 people a year travel to Menlo's Ann Arbor, MI offices from around the world just to see how they do it. Many spend a week or more studying "The Menlo Way," being taught by "Menlonians" who love to share their experience and knowledge. Laura Elliott has worked as a High-Tech Anthropologist® at Menlo Innovations since 2012. Working on a broad range of projects, from diesel diagnostic tools to medical communication devices, she works side-by-side with users, keeping her both fascinated and humble. It was so exciting to talk with Laura about how she applies anthropological theory, methods and tools to whatever she's working on. Ryan Heisler represents the eclectic way Richard has built his team at Menlo. A software developer, he holds a bachelor's degree in Islamic and Middle Eastern Studies and worked in landscaping for several years before joining the company. Ryan credits Menlo's "pairing" culture for helping him grow his programming skills and ability to work with others. Blog: Want To Change Your Organization? Make It Like An Exciting Play.